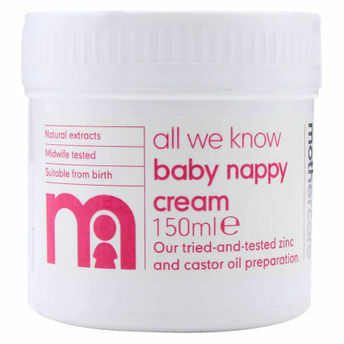 Mothercare's All We Know Baby Nappy Cream is soothing and cooling for baby's bottom and is the perfect partner for nappy changing.This baby nappy cream is made with natural ingredients, including moisturising olive oil and soothing chamomile, which will leave your baby's bottom comfortable and cool after nappy changing. The mothercare all we know baby nappy cream is hypoallergenic and dermatologically tested, as well as tested by an independent group of expert midwives to leave you assured that the baby oil is of the highest quality and is safe to use for your little one from birth. Explore the entire range of Lotions & Creams available on Nykaa. Shop more Mothercare products here.You can browse through the complete world of Mothercare Lotions & Creams .